Like any satellite altimeter mission, SWOT will require models that can predict and remove from the data the generally dominant ocean tide signals. The unique objectives of SWOT place challenging new demands on these models. While deep-ocean barotropic models between the latitudes of ±66° are accurate, thanks to 25 years of traditional high-precision nadir altimetry, barotropic models in high latitudes and in shallow seas and estuaries are often not. Moreover, the SWOT submesoscale objectives require models of low-mode baroclinic tides throughout the global ocean. First-mode baroclinic tides have typical wavelengths in the deep ocean of order 100-170 km for semidiurnal tides, double that for diurnal tides. Higher modes have shorter scales. These tides thus fall directly into the prime mesoscale and submesoscale regime that SWOT is designed to study. It will be critical to remove as much of this tidal variability in SWOT data as possible. Our project aims to develop both barotropic and baroclinic tidal models to support this goal and to deliver models to the SWOT project teams that can be employed for the initial processing of SWOT data. The GOT and TPXO series of global tide models that our group has developed over the years have been extensively used by the satellite altimeter community and also, through many varied applications, by the wider geophysical community. Our efforts to support SWOT build on these existing global models. We intend to focus on model inadequacies in high latitudes and in near-coastal and shallow-water regions. Over the past decade the satellite altimeter community has been extending altimetry into the near-coastal zone, with many efforts devoted to improving "coastal altimetry" (e.g., Vignudelli et al., 2011). The high spatial resolution of SWOT will considerably strengthen the field of coastal altimetry. But to support those efforts we need to improve our abilities to predict the near-coastal tide. Of course, SWOT data themselves will eventually give us valuable new tidal data which is often currently lacking, but until then much can still be done. Our main approach to the problem of shallow-water and coastal tide prediction will rely heavily on the Oregon State Tide Inversion Software (OTIS) and its ability to run series of nested inverse models that attain required higher resolutions in shallow water. 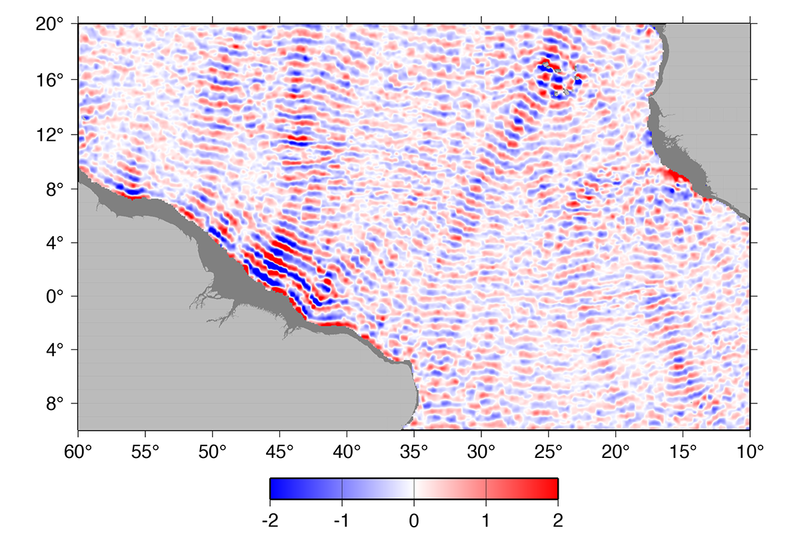 Figure 1 is an example of the kind of inverse-model nesting that we are now employing to improve near-coastal tide models. Panel (a) shows one of our global models in the seas surrounding Australia. King Sound (the small box on left) is a medium-sized bay with fairly complex tides; it is a location where all of our standard global models perform poorly according to local tide-gauge measurements. Panel (b) shows a high-resolution (grid interval 0.5 km) local model which has been blended to the global model and which, while not perfect, agrees far better with local measurements. Inverse model TPXO.8 and the soon-released TPXO.9 have both taken this approach of employing a large suite of nested high-resolution models within the larger global domain, and we intend to develop these solutions further in preparation for SWOT. Figure 1. An example of nested high-resolution tide model, for King Sound on the northwest coast of Australia. Color circles denote tidal amplitudes determined from local tide gauges. We are using a combination of historical altimeter data, numerical ocean models, and in situ data to better understand and model low-mode baroclinic tides in the deep ocean. The goal will be to develop pre-launch models that will attempt to remove from initial SWOT data a large fraction of the sea-surface height variability induced by baroclinic tides. The most straightforward part of the problem is to develop models of the stationary component of internal tides-the component that is phase-locked to the astronomical tidal potential-even though that restricted mapping problem is still quite challenging in light of the small scales involved. Historical satellite altimetry can only marginally begin to do this (see below). Far more challenging will be to develop models that can capture the non-stationary parts of baroclinic tides, since historical altimetry is completely inadequate for this task. Seasonal variability appears to be the most amenable to progress, and at least in some parts of the ocean a seasonal component is clearly evident. So far we have taken three complementary approaches to mapping stationary internal tides. These are (1) empirical mapping based on along-track tide estimates extracted from exact-repeat mission altimetry; (2) a somewhat similar mapping of along-track data but based on utilizing basis functions that satisfy some expected local hydrodynamic constraints (e.g., tidal wavelengths restricted to theoretical values based on local, generally climatological, stratification); and (3) assimilating along-track data into a hydrodynamic model, using the inverse machinery of OTIS but running in a reduced-gravity mode. Each approach has advantages and disadvantages, and exploring each is already proving to be a useful endeavor. Figure 2. A snapshot of sea surface height (cm) of the M2 internal tide, from Ray & Zaron (2016). Some of the largest waves, such as those off the Amazon shelf, saturate the 2-cm color scale. An early example, following approach (1) above and taken from Ray & Zaron (2016), is shown in Figure 2. Displayed are mode-1 M2 internal tides in the tropical Atlantic Ocean, shown as a snapshot of SSH elevations in-phase with the M2 astronomical potential at Greenwich. Examination of phases (not shown) reveals propagation from a large number of wave sources. These waves combine by constructive and destructive interference, giving rise to the complicated field depicted in Figure 2. We stress that historical altimeter data is only marginally adequate to map the internal tides depicted in Figure 2. Nonetheless, it is already clear that such data can be employed as an "internal tide correction" for altimeter data, including future SWOT data. The evidence for this is given in Figure 3 which shows the reduction in variance of independent Cryosat-2 altimeter data obtained by applying the Figure-2 wave field as a correction. Throughout much of the ocean, and especially in regions of known sources of large internal tides, there is positive reduction in variance. The regions where the correction is poor-in fact, adding to the Cryosat variance-are mostly confined to regions of western boundary currents or other regions of high mesoscale variability; in those regions our mapped tidal fields are degraded by the high "noise source" of mesoscale variability, and moreover, in those regions it is quite possible that there is no stationary internal tide to be mapped. In other words, the high mesoscale has possibly destroyed the coherent internal tide signal in our maps as well as in the real ocean. Figure 3. Variance reduction (cm2) when applying our internal tide "correction" to independent altimeter measurements from Cryosat-2. Red denotes positive variance reduction. Blue denotes degradation of the data, which occurs primarily in regions of high mesoscale variability. A the end of this project we expect to deliver to the SWOT project teams a set of models which can be used in the processing of early SWOT data. Based on early results, such as shown in Figure 3, we have some confidence that these models will be capable of removing undesired tidal variability from the SWOT data. We also anticipate that these models will be far from perfect, and they will undoubtedly be deficient in removing non-stationary tidal energy. Of course, the SWOT data themselves will surely help to improve our efforts, once a sufficiently long time series is collected, in much the same way that early Topex/Poseidon data successfully improved barotropic tidal models. Ray, R.D. and G.D. Egbert (2017). Chapter 13: Tides and satellite altimetry, in Satellite Altimetry over Oceans and Land Surfaces, (Eds. : D. Stammer and A. Cazenave), CRC Press, pp. 427-458. Ray, R.D. and E.D. Zaron (2016). M2 internal tides and their observed wavenumber spectra from satellite altimetry, Journal of Physical Oceanography, 46, 3-22. Vignudelli, S., A.G. Kostianoy, P. Cipollini, J. Benveniste (Eds.) (2011). Coastal Altimetry, Springer, Berlin.